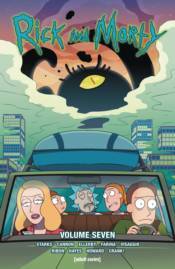 The hit comic book series based on Dan Harmon and Justin Roiland's hilarious [adult swim]� animated show RICK AND MORTY� continues in all-new stories not seen on TV! Catch up on the adventures of degenerate genius scientist Rick Sanchez as he drags his inherently timid grandson Morty Smith on dangerous adventures across the universe! This volume features Eisner-nominated writers Kyle Starks (Sexcastle) and Magdalene Visaggio (Kim & Kim) in collaboration with series artists CJ Cannon and Marc Ellerby, plus guest writers Tini Howard (Rick and Morty�: Pocket Like You Stole It), Pamela Ribon (Moana), and Rick and Morty�storyboard artist Erica Hayes. Watch as Summer discovers doomed romance! Learn the tragic secrets of Krombopulos Michael! Check out some really cool dinosaurs! All that and more in this collection of Rick and Morty� comics! Collects issues #31-35.